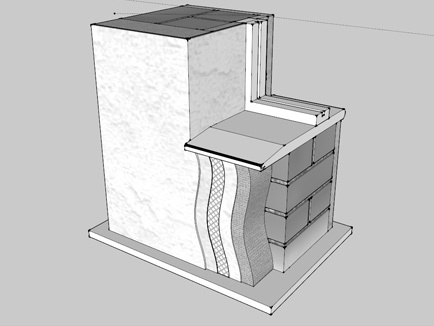 We have completed fifteen sets of these engaging insulation models. They display cross-sections of external, internal and cavity wall insulation methods, and are used for marketing and display purposes. This is of particular use to the Centre for Sustainable Energy in that the models demonstrate practical ways to reduce the energy costs of running a home. At 1:2 scale, realistic brick-like textures were achieved with a range of painting methods and heavy washes to give the appearance of weathering and natural wear. The models proved incredibly popular and Amalgam completed a total of 13 sets, being 39 individual models. By the end of the run, the process for making them had been streamlined to a turnaround of a few days.